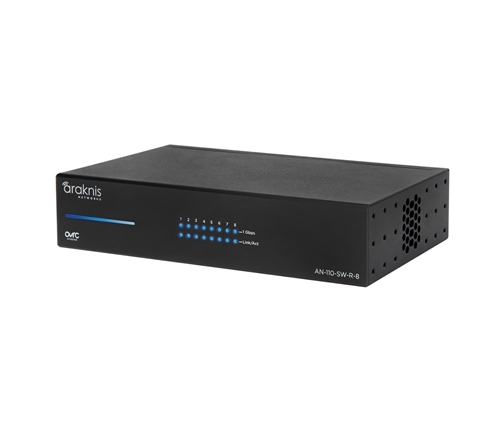 These sleek Unmanaged+ Gigabit switches deliver an unrivaled networking solution for any job. Designed exclusively for custom installers, they offer visibility to end devices via the OvrC cloud management platform, 1Gbps support on all ports simultaneously, plug-and-play capability, and a new rift lighting design with network performance indicators. And with multiple mounting options and a versatile design, this switch can go just about anywhere. See how the 24-port, 16-port, and 8-port models compare to the competition. Both stylish and informative, these blue LED lights indicate power status, port speed (10/100 Mbps - 1 Gbps), and link status. Plus, a redesigned faceplate is constructed with industrial materials, beveled edges, and a glossy finish, making for a clean design you’ll love to show off. Mounting has never been easier. Due to its 1U design and available accessories, it can easily be mounted in a rack, wall, or anywhere in between. Included rack ears make for a sleek, left-justified design, while optional center-mount rack ears offer a more traditional look. To order center-justified rack ears, visit the corresponding product page.